The Wusthof Classic Ikon 5 inch hollow edge santoku knife is a terrifc multi-purpose tool. 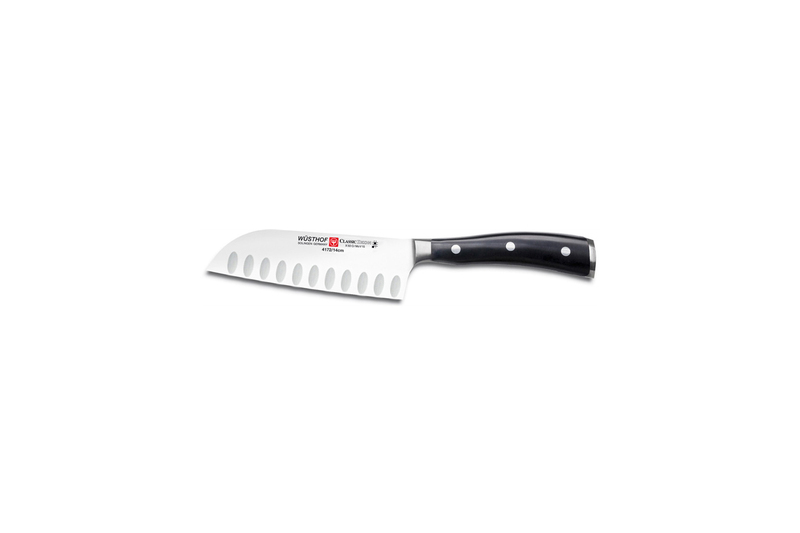 This useful chefs knife has an especially sharp blade thanks to Wusthof high quality construction and German stainless steel. This Asian chefs knife sports a broad blade so you can use it quickly move veggies to the next step after you've cut them. This knife has a hollow edge which helps to keep food from adhering to the blade. You'll love the beautiful and comfortable handle made to fit the contours of your hand. Wusthof backs this Classic Ikon knife with a lifetime warranty. You'll appreciate the comfortable handle design of the Wusthof Classic Ikon knife because it perfectly fits the contours of your hand.